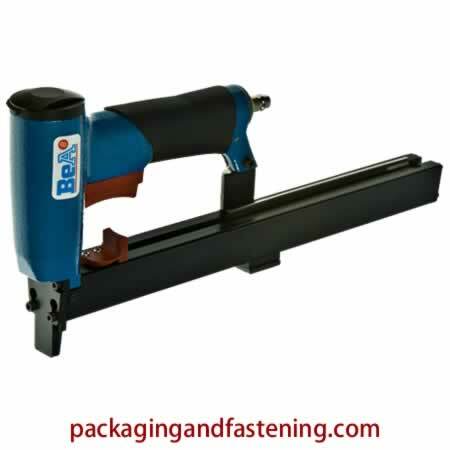 Discover our complete line of fine wire tackers and medium wire staplers including BeA and Bostitch tackers and more. Check out our 71 Series staplers, 80 Series tackers and 97 Series staplers on-sale. 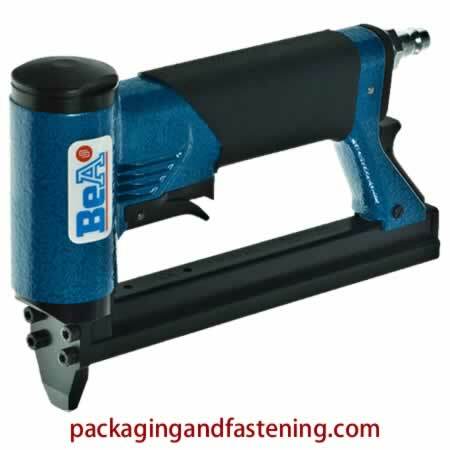 Find medium wire 95 Series staplers to drive fine wire furniture and upholstery fasteners. 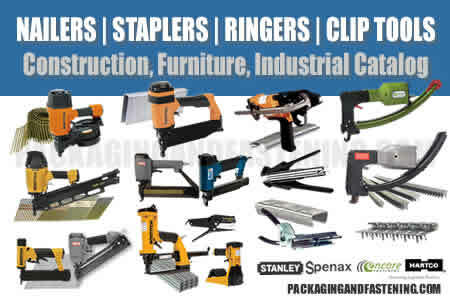 Our wide selection of staplers for furniture, industrial packaging, retail packaging, tagging, bagging, outward flare stapling of insulation or foam plus many more construction applications . Get light wire and medium wire staples available now. 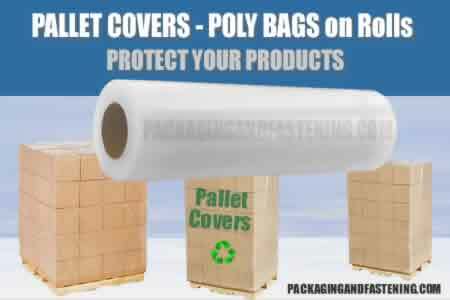 Additionally, round crown bedding staples are included in our online furniture fastening catalog. 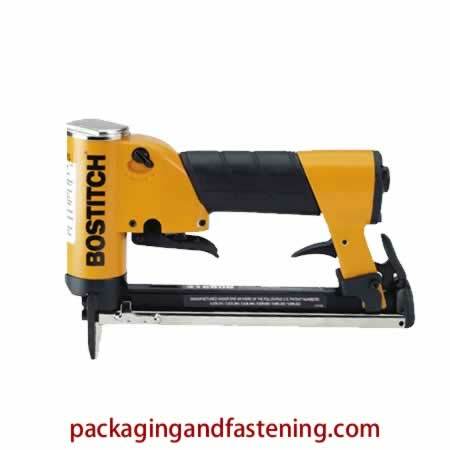 An amazing selection of furniture and upholstery tackers including the Bostitch 71 series line of fine wire staplers are available. 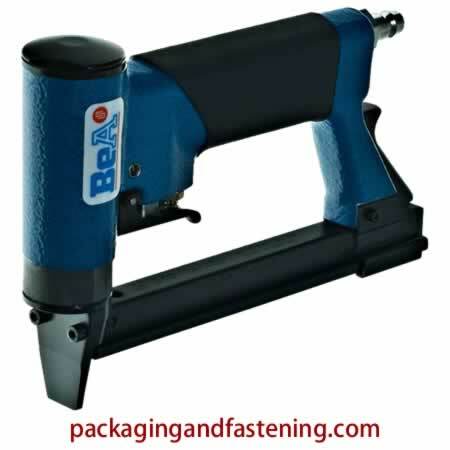 Get 3/8 inch crown light wire staple guns now..
Order fine wire staplers for your furniture, upholstery, construction and industrial applcations in our online catalog. for 71 series from 5/32 - 9/16 in. Fastener Range 5/32" to 9/16"
Order pneumatic fine wire long magazine staplers for your furniture, upholstery, construction and industrial applcations in our online catalog. BeA’s classic. Popular 71/16-401 tacker for industrial and small upholstery applications. Well balanced and powerful for fast and accurate fastening. for staples type 71 from 6 - 16 mm. Long-magazine version of the most popular tacker for industrial and small upholstery applications. The well balanced 71/16-401LM fastens fast and accurate. Stapler with 25 mm long nose. The most popular tacker for industrial and small upholstery applications. The 71/16-421 is well balanced and powerful for fast and accurate fastening. 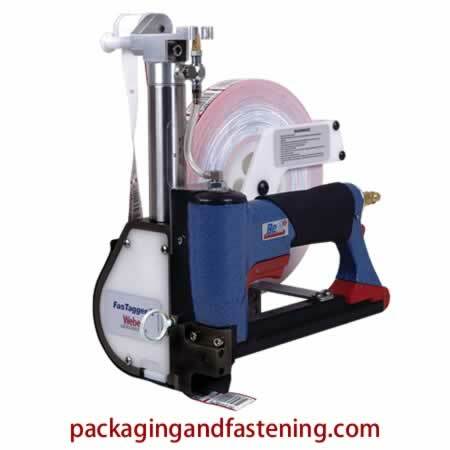 The popular 71/16-421S upholstery tacker with work-contact. Upholstery tacker with blocked out nose. 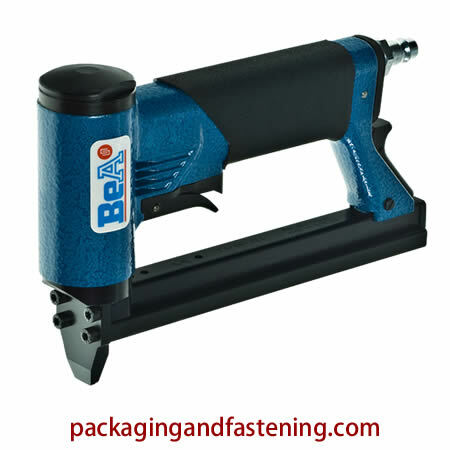 Avoids short staples up to 1/4″ tumbling in the nose of the tool. Perfect for panel applications. Extra slim nose for tight areas. Well balanced and powerful for fast and accurate fastening. Extra long nose for hard to reach areas. Stapler with 50 mm long nose. The most demanded automatic upholstery tacker on the market. The BeA 71/16-436 LN long nose tool has a two stage trigger allows for placement of a single fastener or auto-fire. for staples type 71 from 6 - 14 mm. The most demanded automatic upholstery tacker on the market. The BeA 71/14-451ALM long magazine two stage trigger allows for placement of a single fastener or auto-fire. Extra drive power and long magazine make this 71/25-554LM fine wire tool a popular choice for mounted applications. Long magazine 71 series up to 1 inch length tacker. A unique design, specifically designed for timber-tagging applications. 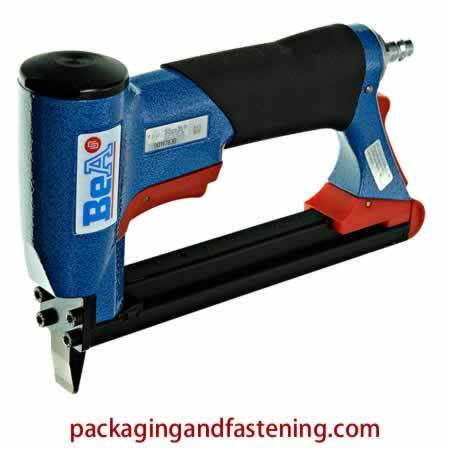 BeA’s 71/16 FasTagger II is a proven stapler is paired with a innovative labeling mechanism giving you consistent results. 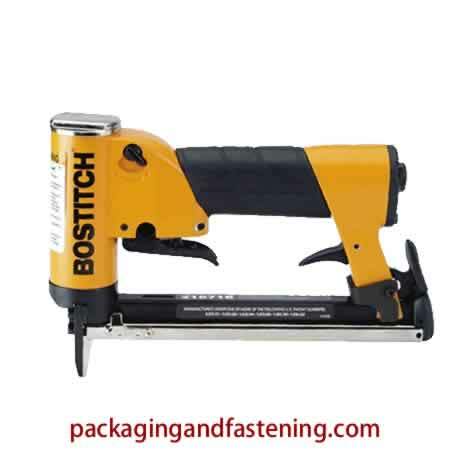 Order Bostitch tackers including 1/2 inch crown .036 x .027 fine wire staple guns at packagingandfastening.com online. 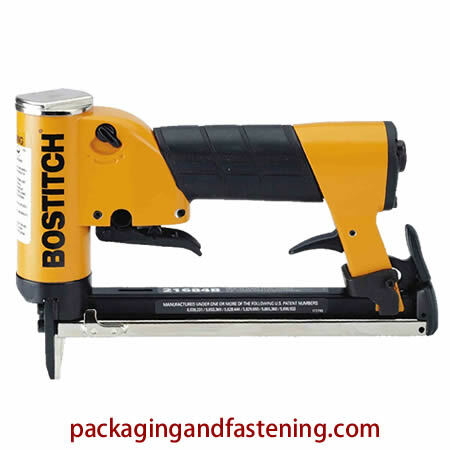 Our line of furnuiture staplers features Bostitch upholstery tackers available now on-sale. 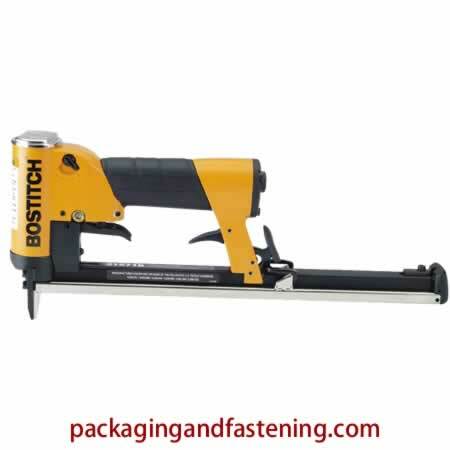 Order 20 gauge pneumatic fine wire staplers including the Bostitch 21680B staple gun for your furniture, upholstery, construction and industrial applcations in our online catalog. 80 Series 1/2 Inch Crown .036" x .027"
for 80 series from 5/32 - 9/16 in. 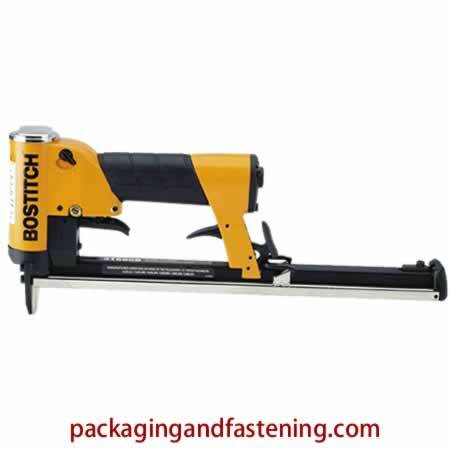 Order 20 gauge pneumatic fine wire staplers including the Bostitch 21680B-ALM long magazine staple gun for your furniture, upholstery, construction and industrial applcations in our online catalog. 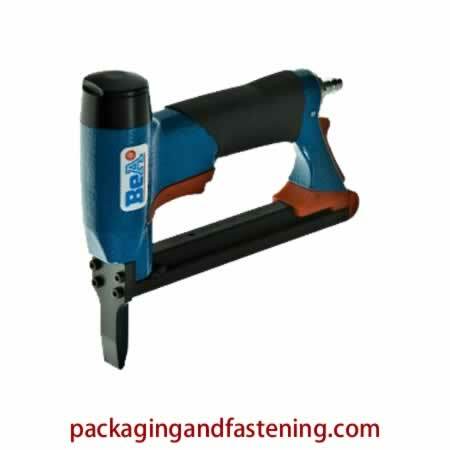 Ergonomic design and ease of service, make this tool a popular choice for industrial applications and craftsmen alike. for staples type 80/380 from 6 - 16 mm. 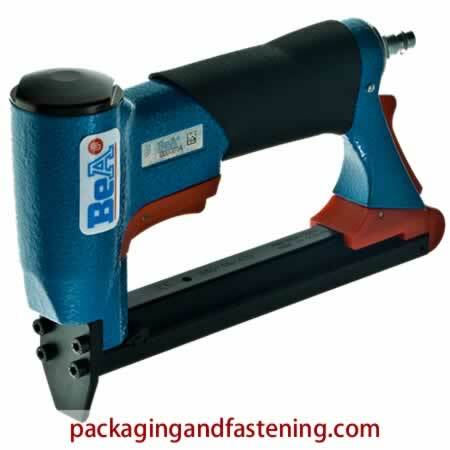 Long-magazine version of the most popular tacker for industrial and small upholstery applications. 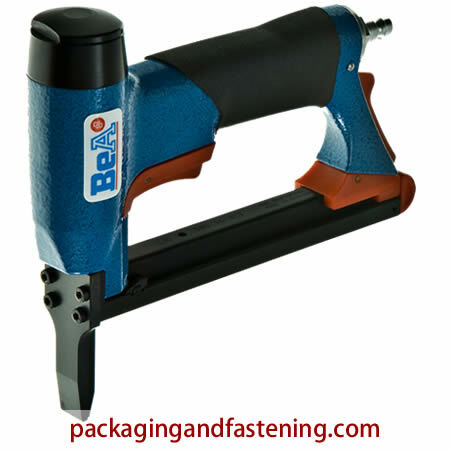 Well balanced and powerful for fast and accurate fastening. 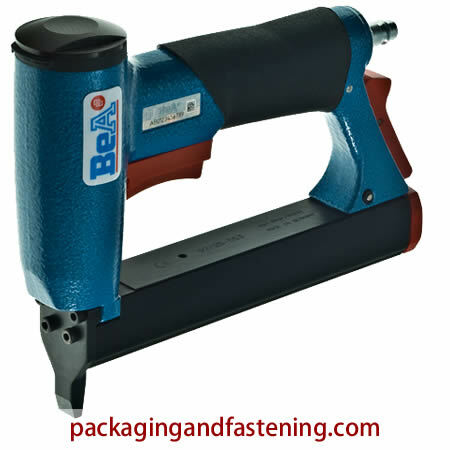 Lightweight and powerful outward clinch tool for applications such as bedding as well as fabric to cardboard. for staples type 80/380 up to 16 mm. 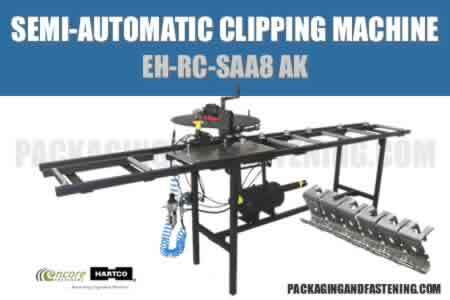 Automatic 80/14-450A automatic tacker for 80 type staples. Two stage trigger allows for placement of a single fastener or auto-fire. for staples type 80/380 from 6 - 14 mm. Automatic tacker for 80 type staples. BeA's 80/14-450ALM Auto Long Magazine tool featurs a two stage trigger allows for placement of a single fastener or auto-fire. Extra drive power and long magazine make BeA's 80/25-559LM tool a popular choice for mounted applications. for staples type 80/380 from 10 - 25 mm. Pneumatic tackers - 97 type fine wire staplers are available now. 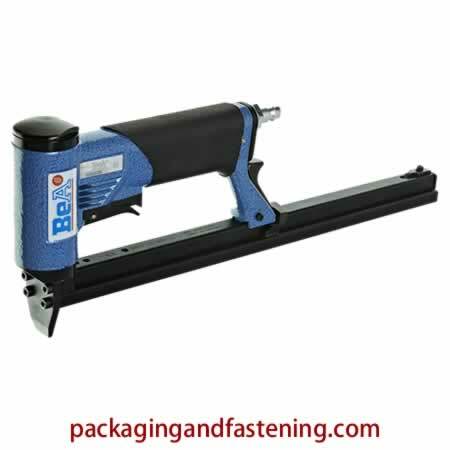 Get light wire staplers in our convenient online fine wire tool catalog. Order 97 Series 3/16 inch crown .036" x .027" flat wire staples in our convenient online fine wire tool catalog. for staples type 97 up to 5/8”. Well-balanced, lightweight yet powerful 97/16-407 tacker for 97 series fasteners. for staples type 97 from 6 - 16 mm. 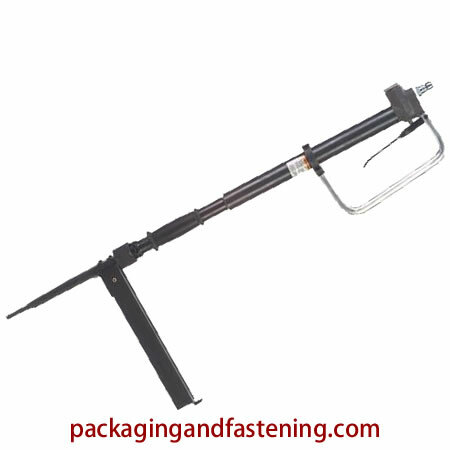 Double length magazine tool for 97 series fasteners. BeA 97/25-530LM Long Magazine tackers are here. 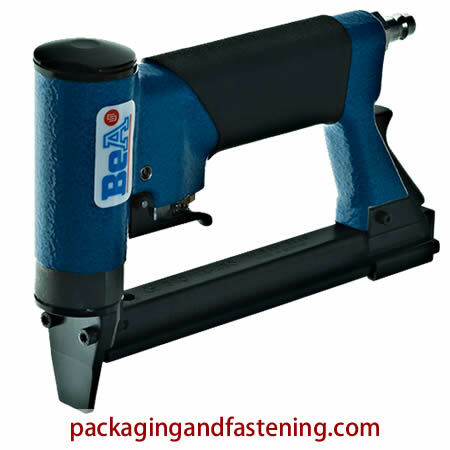 The BeA 97/25-203 stationary unit can be mounted on a table or a stand, providing hands-free operation. Short and compact at 8″ length, the 97/25-550 delivers powerful drive for industrial applications. for staples type 97 from 10 - 25 mm. Short and compact at 8″ length, the 97/25-550S delivers powerful drive for industrial applications. for staples type SBNK from 5/32 - 5/8 in. Well-balanced, lightweight yet powerful tacker for SBNK series fasteners. Order round cown staplers for driving staples into hard to reach places such as construction applications and bedding for stapling bottoms of coil springs to box frames. Round crown staplers are available to fire efficiently benefitting production goals. Order round cown staplers for driving staples into hard to reach places such as bottoms of coil springs. 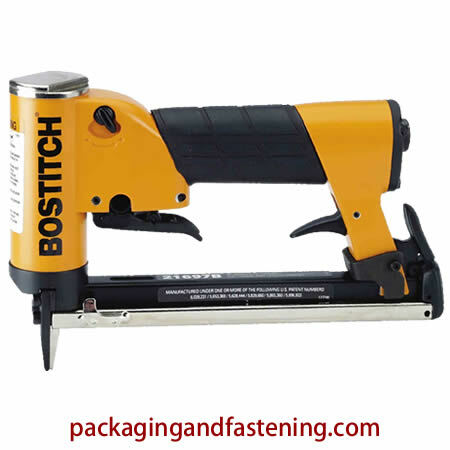 The Bostitch BCAR1B-495-92L is available in single or double staple fire versions. Ergonomic design and ease of service, make the 72/16-422 tool a popular choice for industrial applications and craftsmen alike. Ergonomic design and ease of service, make the 72/16-422S tool a popular choice for industrial applications and craftsmen alike. for staples type 72 from 6 - 16 mm. Automatic tacker for 72 type staples. 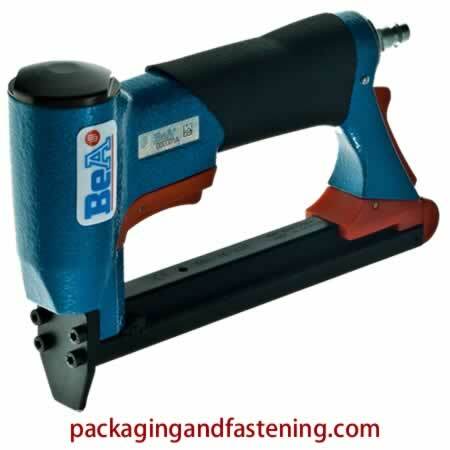 BeA's 72/14-452A Automatic two stage trigger allows for placement of a single fastener or auto-fire. for staples type 72 from 6 - 14 mm. 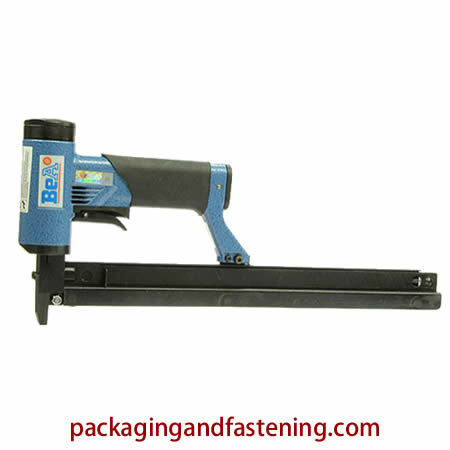 Pneumatic tackers - 95 type fine wire staplers are available now. Get light wire staplers in our convenient online fine wire tool catalog. Automatic tacker for 95 type staples. Two stage trigger allows for placement of a single fastener or auto-fire. BeA's 95/14-455AL long magazine is a excellent for insulation. for staples type 95 from 6 - 16 mm. 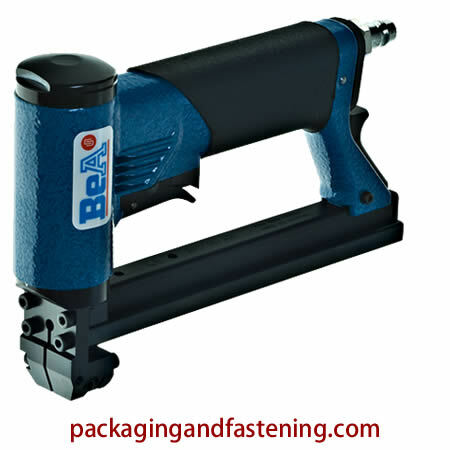 Ergonomic design and ease of service, make the BeA 95/16-425 tool a popular choice for industrial applications and craftsmen alike. Ergonomic design and ease of service, make the 95/16-425S tool a popular choice for industrial applications and craftsmen alike. 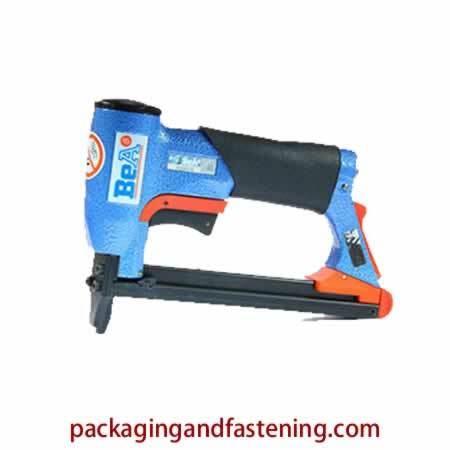 Pneumatic upholstery tacker staples including fine wire furniture tacker staples and medium wire tacker staples are available. Get light wire furuniture and upholstery staples as well as for fastening construction or industrial applications. 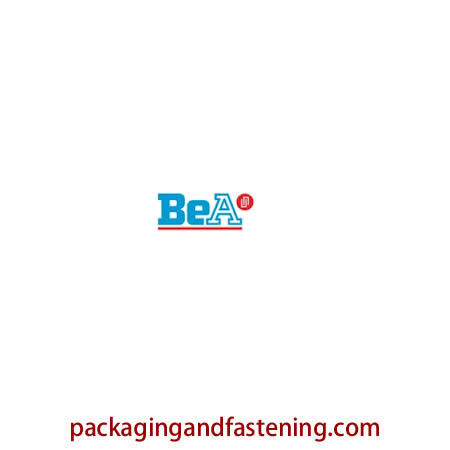 71 series, 80 series and more BeA, Bostitch, Duo-Fast, Senco plus staples for most air tackers at packagingandfastening.com now.Read More.